I was in the locker room of the pool where I swim when I overheard some women talking about food. Naturally, my ears perked up. “The Greek girls, you know,” one woman said while she was toweling off, “the ones who make the great cookies.” I immediately butted in on the conversation. That’s how I found out about Kristina Petrakis, 27, and her sister Danae, 24, master swimmers and master bakers who were born in Greece, grew up in San Francisco, and have been swimming competitively since they were 6. It turns out when they are not in the pool, the sisters bake Greek pastries from old family recipes. They Skype with their yiayia, or grandmother, in Thessaloniki to get her advice on how to make koulourakia, kourabiedes, baklava with walnuts or almonds, bite-size, honey-soaked phyllo cylinders called kourkoubinia and other sweets they used to eat every summer when they went to Greece. For the past year and a half, they’ve been selling these out of their home kitchen, a certified CFO (cottage food operation). They call the business “Boukia” for the small bites they create and I can tell you the bites may be small but the flavors are huge. When I met up with Danae and Kristina, they brought me a selection to taste and I loved them all. 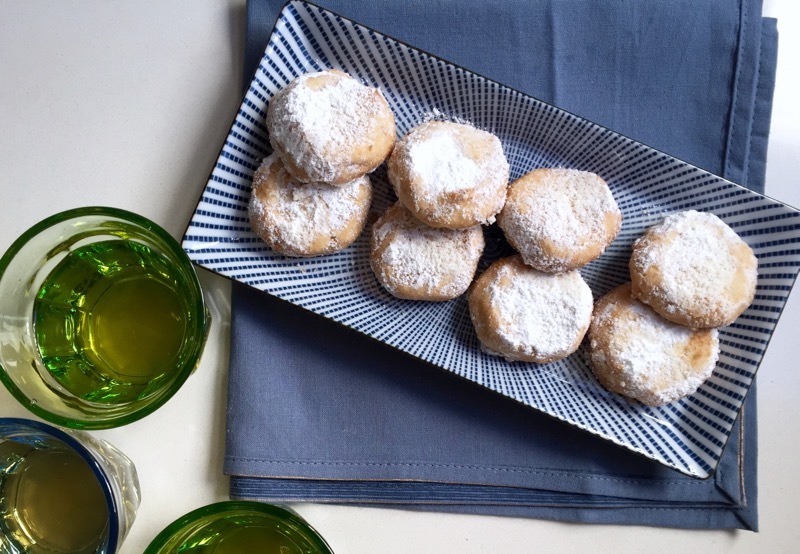 I asked if they’d share a recipe and these sugar-dusted cookies seemed like the best ones to make at home. They are delicate and almondy, not overly sweet, and will remind you of Mexican wedding cookies or Russian teacakes, if you’ve had those. Why not make them this Sunday, which happens to be both Easter and Greek Easter? Or make them any time to dip into coffee or serve with tea or to offer for dessert with Greek yogurt ice cream and roasted strawberry sauce. Or just order from the girls if you live in San Francisco and let them do the baking, between swims. A couple of notes: the girls use metric measurements, like all pros. If you have a metric scale, use that. If not, I’ve given you the measurements in ounces and cups, which I carefully tested. Also, the cookies are traditionally flavored with rosewater and spritzed with it to help the sugar stick. I tried almond extract and no spritzing and it worked beautifully. Spread the almonds on a baking sheet and bake for 5 to 7 min at 375°F until fragrant and just golden. Remove from oven and let cool. Reduce oven temperature to 350°F. In a bowl with an electric mixer, beat the butter until it turns white and fluffy. Add the powdered sugar and vanilla and beat until the mixture is so light and fluffy it almost looks like whipped cream. Beat in the salt, rosewater or almond extract, and baking powder. With a rubber spatula, gradually fold in the flour in batches (it’s important you don’t beat in the flour or the cookies can be tough). Lastly fold in the cooled almonds and mix until the dough is soft but not so soft that it sticks to your hands (if it sticks, add a bit more flour). Roll dough into small balls (about 1-1/2–inch diameter) and make a dent with the tip of your finger in the top of each cookie. This allows the kourabie to hold onto more powdered sugar. Grease 2 baking sheets with light olive oil or line with parchment paper and arrange the cookies on the sheets an inch or so apart. Bake about 25 minutes or until you can smell the cookies and the color is a pale golden hue. Remove from the oven and allow cookies to cool. When cool, dust well with powdered sugar on tops and bottoms. Store in airtight containers for up to 4 days; the cookies seem to get better each day!